The Corporate Method recently produced an exciting event inspired by the theme of 'Discover the World Around You' for the Discovery Networks UpFront event at Sydney's Simmer On The Bay in Jones Wharf. The Corporate Method (TCM) produced an exciting event on Thursday October 18, inspired by the theme of ‘Discover the World Around You’ for the Discovery Networks UpFront event at Sydney’s Simmer On The Bay in Jones Wharf. 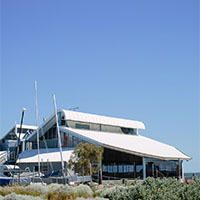 Sydney’s Simmer on the Bay was transformed by The Corporate Method to help guests ‘Discover the World’. “Our goal was to represent the highly respected Discovery Networks brand while highlighting the channel’s three summer productions featuring strong local elements which were being presented to partners, advertisers and affiliates for the first time” said director Monika Toth Lewis. The three Discovery properties included How We Invented The World which was represented at the event by an impressive media wall of the Sydney city scape with billboards advertising the 4 titles created by Anything Theming. The traditional red carpet was replaced by an interactive floor featuring swimming sharks to greet guests. Designer Lucy Weight realised TCM’s vision of incorporating the remaining three inventions of the modern age by suspending custom designed glass baubles hung from the ceiling featuring bespoke paper couture planes, retro model cars and mobile phones. Local host of the program and rugby legend, John Eales, was on hand to speak to the crowd. An interactive floor featuring swimming sharks greeted guests instead of the more traditional red carpet to highlight the much loved Shark Week series. A custom ring toss game was also created with ‘life rings’ to throw over toy sharks for a bit of fun whilst underlining Discovery’s strong commitment to conservation. Inspired by the popular Shark Week series, a custom ring toss game was created allowing guests to use ‘life rings’ to toss over toy sharks. Abalone Wars, the much anticipated new Australian series, was the perfect backdrop for the TCM team to build a tasting station for guests to sample the little known seafood. Steve Hodges from FishFace restaurant delighted guests with delicious sampling during the event, while divers from the series were flown up from South Australia to talk about their exciting and life threatening work. “Our challenge for this event was to effectively highlight the varied programming whilst tying it all together into the one brand.” said director at TCM, Jill Covitz. Anchoring the theme and celebrating Discovery was a 6ft rotating globe featuring the newest generation of NASA satellite imagery representing Discovery’s core brand identity. It's only five weeks until Christmas folks. Get your orders in! 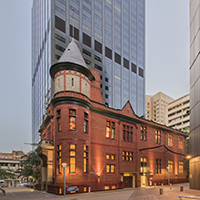 The Science Exchange is Adelaide's versatile multi-purpose venue in the heart of the CBD. Backdrops Fantastic, suppliers of hand-painted themed backdrops for special events.